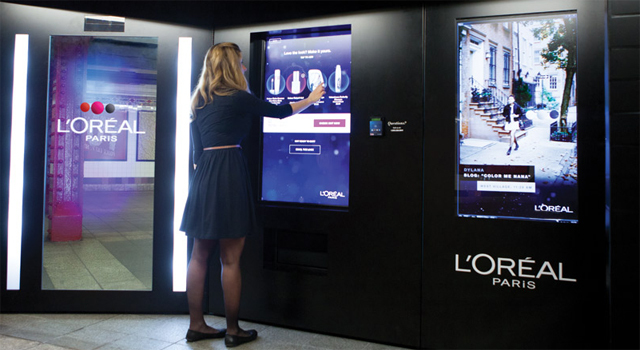 This fall L’Oreal Paris is going underground to the subways of New York City with The Intelligent Color Experience machine. The installation, created in a partnership between digital agency R/GA and CBS Outdoor, features a full-length interactive mirror that uses camera sensors to analyze the style and colour of the user’s outfit. The machine creates a digital animation of the user’s silhouette and colours that they are wearing, and offers suggestions on which L’Oreal products may complement their look. The machine can be stocked with up to 700 items with prices ranging from $6.99 to $9.99. User’s can buy the products directly from the machine using their credit card. The Intelligent Color Experience will be set up at Bryant Park Station at 42nd Street and Fifth Avenue from November 4 to December 30.